Hey, it's Saturday...finally! 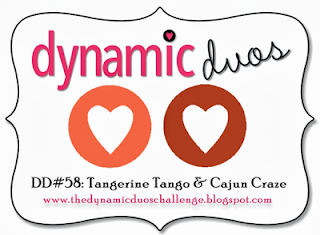 It's time for Dynamic Duos #58 color challenge. 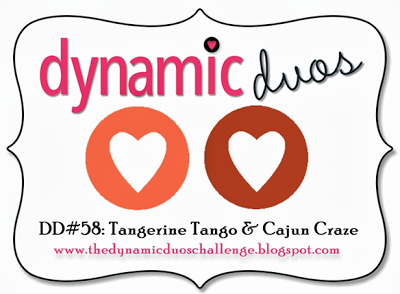 Take a look at the colors Lesley chose for us this week. I have to admit, when I first saw this combo I thought of autumn. Very rich, warm earth tones. But since summer just arrived, I'm not ready for autumn yet! So I used the colors with a nice bright white cardstock for a light summery feel. I was happy to get the chance to use my Stampin' Up! tangerine tango embossing powder. For so long I had only neutral embossing powders - what was I thinking? When SU introduced these fun bright colors, I had to snap them up! Anyway, I colored in just a few hearts and loops with my cajun craze marker. The sentiment is embossed in white. Then I added a few pearls and popped up the sentiment panel with foam tape. I hope you'll play along with us this week. Each week I'm so amazed at all of the beautiful entries in our challenges. I would love to see what you create! So pretty! Love the embossed sentiment. I didn't know I loved that color combo until I saw your card. Susie, that is just beautiful! Absolutely love it with the white. Beware coloured embossing is addictive lol. This is stunning Susie, what a fabulous combo of colour! What a pretty & elegant swirly stamp. I love that embossing powder too. So perfect for the challenge! love, love, love this Susie - I really like the stamp you used. Susie Quilled Elegance is on my wish list. Looks fabulous on your card. Perfectly CAS. Your quilling was splendid as well as the whole design! Thank you so much for picking my card this week- so blessed!